Iran’s 2017 presidential election is setting records. A total of 1,636 men and women signed up to run, an increase of almost 1,000 over the 686 candidates in the 2013 poll. Among them was a record number of women—137. On April 20, the Interior Ministry qualified six men to run: Incumbent President Hassan Rouhani, First Vice President Es’haq Jahangiri, Mashhad cleric Ebrahim Raisi, Tehran Mayor Mohammad Bagher Qalibaf, Expediency Council member Mostafa Mir-Salim, and former Vice President Mostafa Hashemitaba. Iran’s constitution was amended in 1989 to introduce an executive presidency and abolish the job of prime minister. The next three presidents—Ali Akbar Rafsanjani, Mohammad Khatami, and Mahmoud Ahmadinejad—served two consecutive terms. But Iranian elections have often produced surprises. Khatami and Ahmadinejad were both dark horses little known to the electorate. *Only eight candidates were allowed to appear on the Islamic Republic of Iran Broadcasting (state media). Iran’s 1979 constitution does not specify a gender for the presidency. The Guardian Council has never cited gender as grounds for disqualification, although the 12-man body responsible for vetting candidates has also never “qualified” a female candidate. The first woman to register to run, in 1997, was Azam Taleghani, a women’s rights advocate and the daughter of a prominent revolutionary cleric. She registered again in 2009. Now in her seventies and using a walker, Taleghani registered to run for a third time in 2017. "Women make up 50 percent of the Iranian population, so the country deserves at least one female candidate," she said. Her goal was to test the intent of Iran’s constitution. ​"I've come so that the issue with political 'rejal' can be resolved," she told the local press when she registered on April 17. For Iranian leaders, voter turnout is critical to prove the legitimacy of the Islamic Republic. “They are a source of national dignity, of strengthening the people of Iran and of their reputation,” Supreme Leader Khamenei said in March 2017. He has encouraged the public to turn out for the May 19 election. 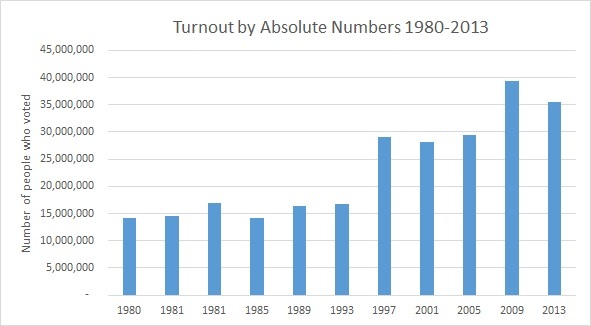 In absolute numbers, voter turnout has generally increased since 1980, a reflection of Iran’s soaring population growth. But the percentage of voters—proportionate to eligible voters—has fluctuated significantly. According to government data, the low point was 51 percent in 1993 to a high of 85 percent in 2009. The 2009 reelection of Ahmadinejad was widely disputed, however, by allegations of fraud. The Islamic Republic does not allow independent monitoring, so verification is impossible. Some 55 million Iranians are eligible to vote in the 2017 election. The 2009 presidential debates on state-controlled television were the first to be broadcast live in Iran. The 2013 debates were particularly fiery, with candidates lashing out at rivals and charging each other with failing the revolution. At least three of the final six candidates called on the commission to reverse its decision. “I don't want to interfere,” Rouhani said, “but I would like the election headquarters to review these discussions.” Raisi and Qalibaf also were critical. In a sermon, Ayatollah Mohammad Ali Mohavedi Kermani also called for live broadcast of the debates. A few days later, the ministry decided to air the debates live. “After deamnds by the Iranian nation and the candidates for a review, the presidential elections campaign commission decided… that debates may be broadcast live,” it said in a statement. The first debate is scheduled for April 28. Deputy Foreign Minister for Consular, Parliamentary and Iranian Expatriates’ Affairs Hassan Qashqavi has announced that Iranian expatriates can vote in 103 countries. A total of 279 stations and 132 embassies and consulates will be open for voting. Qashqavi said that approximately 2.5 million Iranians are eligible to vote in 2017. Garrett Nada, managing editor of The Iran Primer, and Daniel Schnur, a research assistant at the U.S. Institute of Peace, contributed to this roundup.